Sometimes referred to as Stippled Daisy. Not often seen, these ruffled bowls are found in marigold, green, and amethyst. The poppy part of the pattern is on the exterior; the interior is plain except for a stippled daisy-type design in the center. They measure about 7 1/2 inches across. 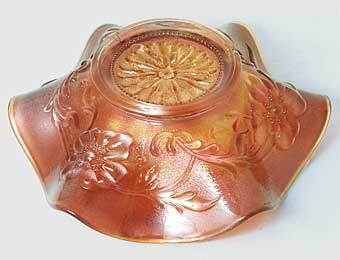 The pattern was one of the first that Northwood applied the iridescent treatment to--about 1909. 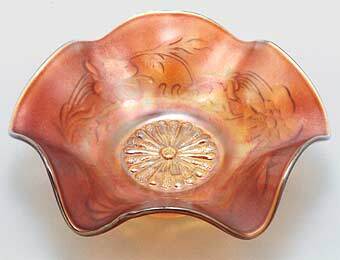 In 2005, an amethyst bowl brought $19, and in 2013, another amethyst bowl sold for $35 at a live auction. Marigold and green sell for between $10 and $20.